A few weekends ago, I found myself sitting in a darkened theater in Chelsea at the Imagine Science Film Festival watching a short film called Anosmia. It was about – you guessed it – anosmia, the lack the sense of smell. The people interviewed could not smell for a varietys reasons: some had congenital anosmia and could not conceive of a world with smells, or even what a smell was. Others described in heart-wrenchingly honest detail the accidents that damaged their brains rendered their world scentless. With Thanksgiving on my mind, I was eagerly anticipating the mouthwatering aromas of sweet potatoes and pumpkin pie that would welcome me home and envelop me in a cozy, blissed-out holiday daze for four days and therefore, not surprisingly, I was horrified by the thought of not being able to smell those smells ever again. Or, I suppose, it was more that thinking about losing any my senses that made me uneasy. Uneasy not in a “How will I cross the street if I’m blind?! ?” practical sort of way, but in a deep (don’t laugh) existential, “What do I have if I don’t have my senses?” way. If I can’t perceive something – be it a sight, a smell, a sound, a touch – it effectively doesn’t exist for me, so to lose one of my fundamental ways of understanding things – of understanding how things exist on a very basic level – felt like it would be losing part of my world, and, weirdly, of myself. If my plight sounds familiar, that’s probably because you’ve heard it before. Descartes was getting at the same thing, though much more eloquently, in his struggle to reconcile his perceptions of his own consciousness and, ultimately, his existence. His “I think, therefore I am” is a hotly debated philosophical axiom and a compelling hypothesis for the daring neuroscientists brave enough to swim in the murky water that is the study of consciousness. It’s the premise my musings boil down to – namely, that we are made up of our thoughts, our perceptions, and consciousness as we know it is contingent on our being capable of continuously sustaining these thoughts and perceptions; we think, therefore we are. If Descartes and I are on the same page here, then science has our backs, sort of. 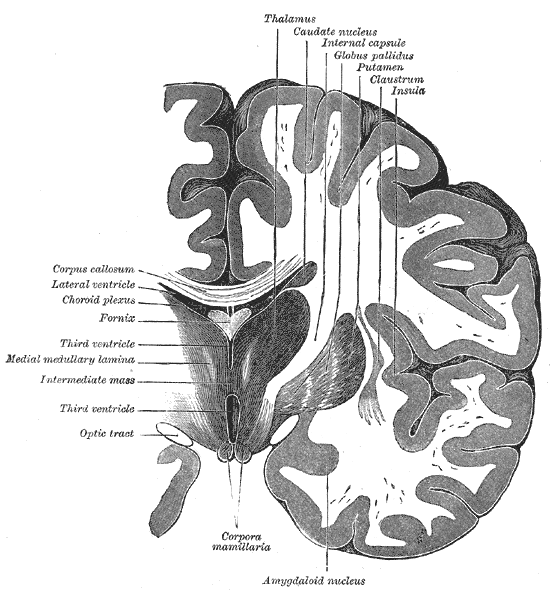 In doing some research (that is, intense googling) in hopes of validating or assuaging my worst anosmic fears, I came across a little area of the brain called the claustrum: a thin, curvy layer of gray matter tucked away under the cortex, one on each side. Interestingly, this waif of a structure forms connections with innumerable cortical loops, creating cross-talk connectivity with most of the cortex. All sorts of information converges here – audio, visual, motor – and its role as this integration center has lead scientists Francis Crick (of DNA-helix fame) and Christof Koch to propose that the claustrum is the “conductor coordinating a group of players in the orchestra, the various cortical regions” – essentially what allows the nutty aroma, hot temperature, liquid consistency, brown color, and bitter taste perceived while drinking coffee to be interpreted as a whole, the experience of drinking coffee, rather than a constellation of sensations. Anatomically and physiologically, the claustrum is ripe to be picked out as the seat on consciousness by careful future research. Is the claustrum the “Cartesian theater” in which our only view of the world is played out for us? Maybe. Maybe not. Honestly, we don’t really know, and science is still in the early stages of figuring out how to experimentally manipulate the claustrum so it can be studied. The idea has been proposed before, though, and disputed by scientists and philosophers alike (particularly vocal among them is the philosopher Dennett, who opposes the reductionist argument for consciousness but, unfortunately, whose writings I’ve had a difficult time actually getting my hands on). What if the claustrum is what gives rise to the experience of consciousness? What if this thin, oscillating network is essentially what defines our world, our existence and the existence of things around us? What are the implications? I, for one, have mixed feelings. On one hand, as a student of neuroscience who is daily astounded by the complexities of the brain, discovering the seat of consciousness would be an unprecedented victory for science, not only in terms of uncovering the secrets of the facet of neuroscience most shrouded in mystery, but in proving that our brain, our intellect, is capable of teasing even itself apart, and can analyze and understand anything that comes its way. On the other hand, though, is my apprehension with the reductionist take. To think of everything I am as the binary output – fire, or don’t fire – of a single network is unsettling. It’s my anosmic nightmare of waking up without a sense of smell and finding that the world is actually no more than the arithmetic sum of my neuronal firing and that, with my sensory inputs altered, my consciousness is diminished, the world is diminished, and, ultimately, my perception of myself is diminished. But who knows what the implications are, if there is even enough evidence to be considering the implications? I pose these questions because I don’t – we don’t – know the answers, and, moreover, we don’t know if science will ever reveal them to us. So, I’ll leave this open ended: what do you think?